April 6, 2008 - "French doping agency sends Armstrong report to WADA" (1). This is nothing less than the official launch for the process leading to the summary execution of the greatest cyclist ever. But Lance Armstrong is also ultimate example of the reduction of the ability to see the basic pieces of the puzzle, beginning with those directly related to him. Although he reacted to previous cases of other champions being falsely accused (see Floyd Landis) he was not able to look beyond the "unfair" media campaign. He was as blind as to accept to take part in McCain's campaign. The ultimate sign of loss of ability: he failed to see that he had the second main and final role in the final act of the "all champions dope" script, together with Usain Bolt. A second role that would only be possible if he would fall in the trap of competing again, to "prove" that he never doped. Not only will he follow the same fate as Usain Bolt, but also, the latest after his accident in Spain, the illuminati decided who will be executed first. 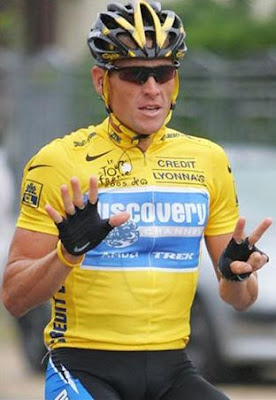 As Lance Armstrong won his last Tour the illuminati doping agenda was still far from the current and very last stage. A stage which allows only for summary executions, shortly after the neo-Gestapo knocks on the door "at 4 A.M". Today it was the door of Lance Armstrong. A trap no longer required had the current and ultimate terror level, legalizing the trick used to accuse the athlete and to discredit any performances at any later time, already been reached when Armstrong won the Tour the last time. The trick is to "keep blood samples", using the "doping industry is more advanced than the test industry" justification to cover-up why this is done. Note that this method allows to post-execute athletes who could not be executed at the best possible moment, because at that particular competition the conspirators did not completly control the tests. As for the 100 and 200 world records by Usain Bolt, at the Beijing Olympics: China government are illuminati puppets, but that's not the case of Putin [update : Putin murdered and replaced with an impostor, 2010]. Jan 2013 - Armstrong forced to confess the Guantanamo way, same as all other champions, starting with Marion Jones. In other words: thereatened that otherwise he would also be jailed and stripped of every penny. It begins by using associaton and suggestion techniques, before it will come very soon to an end. At the end of the day, why "not very soon"? Because postponed again and again, first because of admitting it was still not possible to have americans swallow Hitler's daughter Clinton as president [finally coming after Easter Sunday 2018, after actors Obama and Trump stripped]. "Osama resurrects in Jerusalem" - why missing Boeing 777 script (originally to be launched March 2012 not 2014) postponed, modified. Show to end all shows: Introduction: First act was scripted for one year before the last!! Explanation reads like a chronicle of how illuminati overtime was extended after the original end date, Easter Sunday 2012. After 1,000 articles in 100 blogs, this was the first and so far only one to include an exclamation mark. Explanation for Easter Sunday 2016 added together with the second one. Universe World and Human Physical Limits: was the very LAST milestone set at Rio's 400 meters? Did Van Niekerk's 400 m set a milestone in the Age of Discovery of Human Physical Performance? Was it actuallyt the very last one? - at the end of a show the Illuminati Grand Master reduced to a parody of simulated reality. - just before Usain Bolt would set yet another milestone, this time only in the 100 m History of World Championships and Olympic Games, adding to seven consecutive global titles. The same number of titles as the greatest cyclist ever got in the Tour de France before he was executed by the illuminati.